This inviting lake front house has been completely updated Jan 2016 and has much to offer in Captain Ron's no-wake cove. 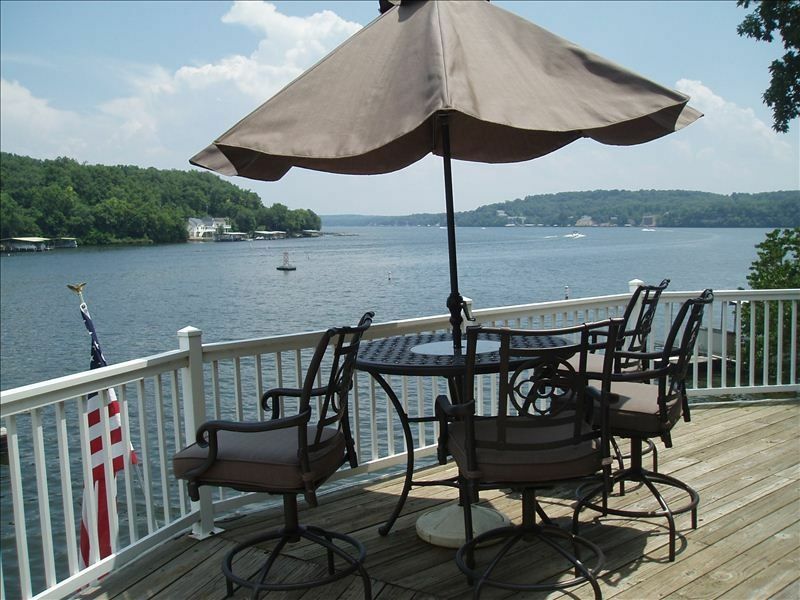 Be sure to check out our other two nearby lake houses: #699133 & #419921. The list of updates include: New kitchen cabinets, appliances and granite counter tops. Bathrooms updates: tile showers, new vanities, counter tops, light fixtures and tile floors! Bedrooms have new windows, ceiling fans, paint and carpeting! Imagine relaxing on the double decks just feet from the lake with a panoramic views for miles, or in front of a romantic fire in the stone fireplace. Ask about the hand split oak firewood we offer for sale! Or enjoy our outside fire-ring for your family bonfire! 2007 Triton 25 foot tri log with a 175hp Mercury 4 stroke for rent to our guests. Easy to get to and close to everything. With blacktop the whole way to the lake house. Great fishing off the dock over our many crappie beds and where bald eagles can often be seen wintering on the lake. Many activities including water sports, shopping the Osage Outlet Mall, golfing, hiking Ha-Ha-Tonks State Park, Big Surf Water Park and so much more. We are located near the Hurricane Deck Bridge at the 34MM. From the double decks you have a main channel view from inside the protected cove. The same terrific view is available from inside the home- this unique six sided wall of glass-- truly a WOW Room!! Beautiful stone wood burning fireplace. Home backs to the east for cool afternoons and morning sun rises on the decks! With two seperate TV living areas, this 1,950 square foot home has room to relax. From the double decks you are literally only a few feet from the lake and have a terrific main channel view from inside the no-wake cove. The dock has a swim platform and an area to enjoy the sun!! Terrific fishing around the established crappie beds. Sleeping arrangements made easy with 3 bedrooms and 2 full bath plus a bunk area in the finished lower level. The bunk area has a twin over a double- bunk bed plus a separate stand alone double bed and sleeper couch. You are within walking distance to one of the hottest family friendly spots on the lake--Captain Ron’s Restaurant and Bar with live music, tiki bars, large sand beaches with beach volleyball nets and swim area. Pirate's Point Boat Rental is right around the point, less than a 2 minute drive, where you can rent boats and jet skis of all types! Estimated times from our driveway: Wood's Super Store under 5 minutes. Outlet mall about 22 minutes. Tons of restaurants and shopping within 10 minutes. Easy directions, just a half mile off Hwy 5, black top all the way! Cell phones work great at the lake house. Terrific for the Shoot-Out and BroStock events at Captain Ron's. Our second lake house is larger and offers 4 bedroom, VRBO #699133 and is across the lake!! If you desire a 5 bedroom lake house- check out VRBO#419921 about 4 1/2 miles by water and about a 7 minute drive. Both top quality! Fully equipped kitchen, gas grill, charcoal grill, linens and laundry room with washer and dryer provided. We advise you to bring your own life vests for you and your children. This Lake Home is a smoke-free environment. We ask that if you smoke, please do so outside on the grounds or deck, policing your trash, thank you. A variety of attractions are within a 20-minute drive. The Outlet Mall shopping is a favorite where we can shop til you drop and then catch a movie. Enjoy day hikes in Ha Ha Tonka State Park where you can picnic and swim while exploring the ruins of a real castle, a natural arch, caves and large spring. On your way back to the lake house stop in Camdenton at a fresh fruit and vegetable market. Bridal cave is also nearby with its spectacular geological features. Enjoy near by Big Surf Water Park or several terrific golf courses. Ol' Kinderhook GC is one of my favorites and the home of my only hole in one! Please email or call with any questions. Terrific for building family memories!! This lake home has it all! Important features for us were the terrific views from the double decks and from inside the home, the no-wake cove, easy drive with black top all the way, fire pit, wood burning fireplace and a short 5 minute drive to grocery stores, restaurants and shops. Relaxing with live music at Captain Ron's is a great way to unwind with that special 'lake feel'!! Walking distance to one of the hottest spots on the lake in Captain Ron's family restaurant and Pirate's Point Boat and Jet Ski Rentals is just around the corner. Our family enjoys water sports and day hikes in Ha Ha Tonka State Park about a 20 minute drive away. Outlet Mall shopping is a favorite where we can catch a movie with the kids. Limited to 3 autos. Parking can be an issue. One space for a small to medium sized trailer. Offsite parking can be utilized. Interior bath towels provided. Please bring your exterior beach towels. Mr. Coffee type. The most common type of coffee maker. Three TVs: flat screen over the fireplace. I think it is 42', master bedroom & lower level family room. We rent our pontoon separately. Many near by boat rentals places. Contact owner for a list of 5. Nearest is Pirates Point, less than a mile with a informative website. The home has two decks at waters edge plus a swim platform on the dock. Many courses close by. The closest is Indian Rock & may fav is Old Kinderhook! Swim & sun platform, double decks & fire ring. good fishing around dock in our crappie beds. We had some issues, but the owner did respond to them and solved them the best way he could. The location is very good. Very clean and great view! Very easy to get in touch with owner. The inside of the property was clean. Great view of the main water channel area. The kitchen and bathrooms were updated and the appliances were all up to date. It was a quiet neighborhood in the Fall when we went. It was close to Laurie for food, etc... There were just a couple of things that may need some updating in the future but overall a great place to stay. Great location, easy access, no gravel, super view from the house. Randy is very good about staying in touch and answering any questions you may have. Caught some crappie and catfish and had a good time. A return trip next year is a definite possibility. We stayed over a rainy and cold weekend but because the floor to ceiling windows made up over half of the main room in the house we were able to enjoy the view all three days. The fireplace was essential and we relaxed in front of it while taking in the lake. Randy was great to work with and very attentive. A great cold weather retreat! The updated kitchen and bathrooms were great. Lots of space. The deck needed a good cleaning. Thank you for letting us know. We will get the deck up to speed. We have already decided to re-stain the deck and repaint the handrails before next spring. Second Lake House VRBO #699133- is across the lake offering 4 bedroom, 2 bath, terrific lake views from the double decks and in great condition. Triton pontoon boat, with three logs for stability and a 175 hp Mercury 4stroke for rent to our guests. Captain Ron's Pirate Bay bar & grill, one of the lake's premier experiences is a one minute drive: terrific food, live music, tiki bars, sand beach, volleyball and pirate ship rides...the whole "lake feel" to help you unwind!! Ha Ha Tonka is just 12 miles by water and 15 minute drive. Terrific State Park for hiking with many attractions including the castle, large spring, and many walking trails. Old Kinderhook golf course is 12 miles. Indian Rock golf course is 10 mikes.